Based in Eau Claire, WI, We Design, Engineer, and Manufacture Dies for Customers Worldwide. In our products, we focus on process knowledge, precision manufacturing, and product performance. In our team, we cultivate a culture of innovation, relationships, and high ethical standards. Coating Tech Slot Dies is always looking for the talented team members, whether a job posting is active on this page or not. Types of expertise that are a fit for the Coating Tech Slot Dies team include mechanical designers, mechanical engineers, fluid flow analysts, finite element analysts, CFD simulation specialists, process engineer field service technicians, quality/inspection specialists, purchasing agents, and machinists. 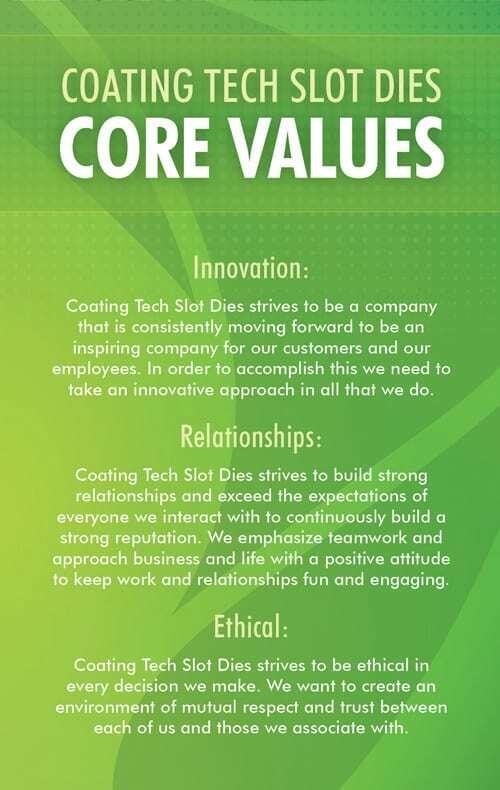 With Innovation, Relationships, and Ethics at its core, Coating Tech Slot Dies is consistently moving forward to be an inspiring company for its customers and employees. An emphasis is put on teamwork and approaching business with a positive attitude to keep work fun and engaging. Coating Tech Slot Dies also offers a competitive benefits package for its employees. This positions primary function is operating CNC surface grinder(s) with attention to detail and precise flatness and finish tolerances. In addition, this position will perform a variety of tasks including machining of parts on manual and/or CNC mills and lathes, polishing/deburring parts, assembly of manufactured equipment and general shop cleaning and maintenance. Must be able to work independently on a list of tasks and be responsible to complete the required tasks in a timely manner. Working closely with the Shop Lead to ensure all fabricated parts and assemblies are machined and assembled to the company’s high standards. Capable of running manual mills and lathes to machine parts according to the provided print dimensions and tolerances. Familiar with standard concepts, practices, and procedures within a manufacturing environment. Capable of performing a variety of tasks under general supervision with a certain degree of creativity and latitude as required to accomplish the task. Good interpersonal skills and commitment to the company’s core values. Coating Tech Slot Dies is an Equal Opportunity Employer. This job description can change at any time as the needs of manufacturing change. Please forward resume and cover letter to [email protected] or upload documents below. Are you interested in working with an innovative company with growth opportunities that values your skills, creativity, and work ethic? Send your letter of interest and resume at any time to [email protected] All inquiries are handled with confidentiality. *Please be aware of any confidentiality or non-compete agreements you have with your current employer. Do not apply if you are bound by an agreement that would negatively affect your employment here.